Mobile now commands 45% of consumer attention in the US, yet currently accounts for only about 5% of marketing budgets. Similarly TV commanded a share of around 35% of media consumption yet around 42% of budgets are allocated to it. What is going on here and why the divide? To explain this we first need to look at the progression of the digital media channel. Traditionally, software was developed individually for specific platforms, such as Windows, Linux, or Mac OS. Today, developers build Web-based applications that are completely independent of the user’s actual computer operating system. We have got used to creating things once instead of per platform. With the proliferation of Mobile devices across individual platforms (iOS, Android, Windows, Blackberry etc. ), a trade-off has opened up whereby if one wants to create a more specialised experience that utilise the native functions of the device (i.e. an App), they have to do so individually for each device platform. An expensive and high-effort endeavour that feels like the antithesis of how the industry has been progressing. In just about all enterprises their technology stack – and skillsets – are based on web-based architectures. This has led to a default strategy of ticking the “Mobile box” where possible. A consequence of this has been a “Responsive” approach where the same Web based developers could enable a single build to work across all mobile device screens. The result, while easy to implement, is a watered down experience for the end user. To remedy this an “Adaptive” approach, which offers a better user experience that is more tailored to the device type, has become more popular. However, this still results in a sub-optimal experience and is a far cry from the native experience that users have enjoyed within an App. Overall, the fact is that most enterprises – and indeed digital agencies – are still Web first or even Web only. This is simply not good enough. Each platform has thousands of very slick API’s which are built to offer the user the best experience but can only be utilised within a native App. 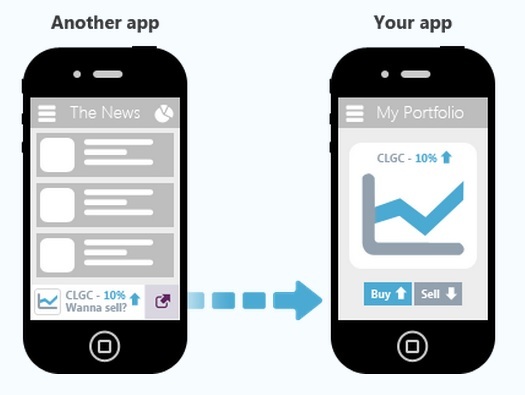 It’s no wonder that over 85% of Mobile use is via Apps. Customers deserve a better experience. The good news is that things are changing. Last year in 2013, three out of the four behemoths, Google, Facebook & Amazon all invested heavily in Mobile (Apple was already there). Facebook now has 60% of revenue coming from Mobile tripling their profit at the same time. A large part of their future growth will be focussed around “Deeplinking” – often called mobile deep linking – which effectively allows anyone to create hyperlinks direct into content within an App. Quite a simple thing on the internet but something that has been hard to replicate within the closed environment of an App. Suddenly Facebook advertising will be open to a whole new landscape of app-based content. Google are utilising this functionality a slightly different way, calling it “App Indexing”. They are utilising it to be able to rank App content within their SERPs. Effectively it will create a whole new SEO focus for Apps. The implication of this for everyone is quite huge. Now, users will be able to link from App to App or Web direct to App, which is a game changing experience on Mobile and massive new revenue stream for the platform. It paves the way for any kind of contextual based messaging to be passed from App to App for example having a flight cancelled and being able to single tap from airline App to hotel App and having all relevant data transfer e.g. name, length of stay, room type, loyalty program etc. The value of each App increases substantially when we are able to drive traffic to it via advertising, EDMs, Web pages, Social media or even other apps. Suddenly we are able to monetise it better and demonstrate ROI. With these new use cases, functionality and – most importantly – revenue streams available the business case to be creating greater mobile experiences via native Apps will become easier to justify. This is great news for the industry and the first step to a movement towards a “mobile-first” approach that has substance (rather than be used as a buzzword). Cross platform App-frameworks are getting better also. Development platforms such as Xamarin are a hybrid approach where Web technologies can coexist with native attributes on the device. This is not a silver bullet and isn’t appropriate for all apps but it does further demonstrate that App development is becoming more accessible again. All in all, the future of mobile is going to be within App development. It offers the richest, quickest and most seamless experience and is what the majority of people are using their device for now. As the App development landscape becomes smarter, richer and more jam-packed with features it will become the default approach again. The sooner the better.